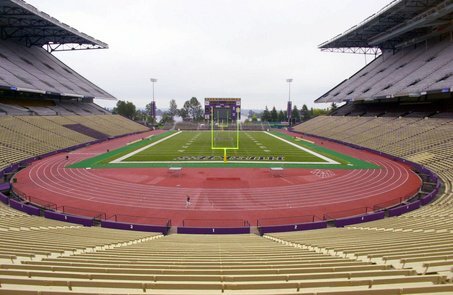 Wondering how to get to Husky Stadium for the UW vs UCLA football game this Thursday? The much anticipated football game between University of Washington and UCLA is scheduled to take place this Thursday during peak rush hour (5pm) at Husky Stadium. Many are anticipating that the game will cause severe traffic and parking problems in surrounding areas because of the game’s start time. To help get Husky fans to the game, the University of Washington is offering free roundtrip shuttle service from Seattle Center to Husky Stadium. You can take the monorail from downtown to Seattle Center! 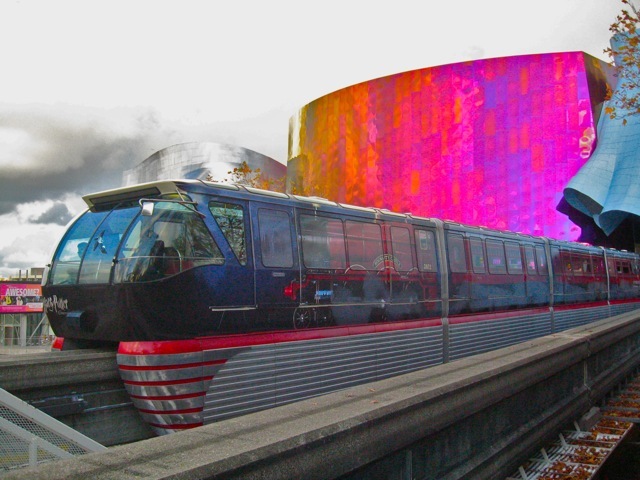 Save time and money by using the monorail rather than having to pay for expensive parking at Seattle Center (metered street parking around here has a 2 hour maximum). The Monorail will be operating from 9am to 11pm – so you’ll have plenty of time to catch it back to downtown Seattle after the game. Go Huskies! The Monorail is currently wrapped as the Hogwarts Express! This entry was posted on November 15, 2010 by Megan Ching. It was filed under Information, Upcoming Events and was tagged with Free, Getting to the game, Husky Stadium, Monorail, November 18, Rush Hour Traffic, Seattle Center, Shuttle Service, UCLA Football Game, University of Washington Football, UW, UW Football. While I commend your action to provide bus shuttle service to the Husky game to reduce car traffic, it is absurd to plan a shuttle bus pickup at Seattle Center, which is also a congested location with many events scheduled at the same time. You are only assuring there will be gridlock in the Seattle Center location as well as the University area. Thanks for the feedback. It’s a challenging situation because of the 5pm start time that has been scheduled for the game to begin. No matter what alternatives are provided, there will undoubtedly be delays and congestion in the areas surrounding UW. Seattle Center is actually one of many locations where the shuttle buses will be picking up passengers for the game. University of Washington is attempting to provide numerous locations in both Seattle and on the eastside to try to make it easier for people to get to the game. Other locations include: Washington State Convention Center, Northgate, Ballard, Kirkland, Redmond, Safeco Field, Qwest Field, etc. According to the UW’s website, all of the locations are full and no longer accepting registration except for Safeco and Qwest field.